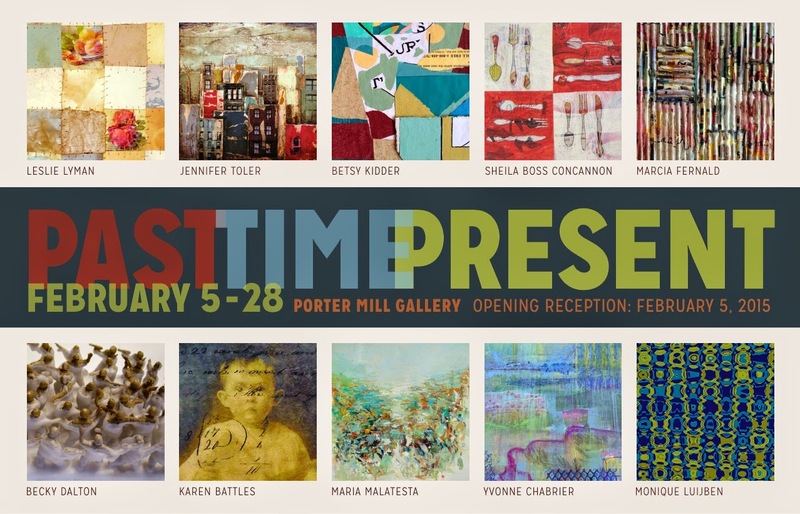 Past Time Present features ten artists whose works are inspired by time and memory and expressed through a variety of media that includes printmaking, collage, painting, image transfer, and sculpture. Memory of place is the creative catalyst and a point of departure for many of the pieces presented here. In some cases, juxtaposed blocks of color bring to mind a myriad of houses or an undulating landscape. In others, sanded surfaces suggest the wear and tear of time on the façades of old buildings or the erosion of the land itself. In still other works, layers of paint evoke the expansive space of the sea or reflections of the spaces in between. For other artists in the show, discarded photographs and found objects are the beginning of the story. These artists stitch, mend, and otherwise layer the objects and images on carefully chosen surfaces to create an eloquent narrative for the individuals captured in the photos. These pieces bring these unknown people out of the past to be seen in the present with new eyes. Many of the artists presenting in this show have previously shown together and have developed into a supportive and inspirational collective. The commonality of the work in this show is that it draws from a well of memory from both the internal and the external world, while each artist brings her individual vision and creativity to the work.